In the past I’ve been too timid with heaping the highest honor on an album, fearful I’ll regret it or be tied to calling it a classic for all of eternity. In retrospect I’d love to redo a couple album reviews, because I know that I didn’t give five stars to either of my favorite two albums of all time. In fact, I haven’t handed out a five star rating in nearly four years. So, without further ado, congratulations, Bon Iver, the honor of the five star rating is yours. Bon Iver’s backstory for album #1 is now famous because it’s almost too good to be true in the indie world: bearded indie man retreats to Wisconsin cabin alone for four months and emerges with a heartbreaking album. The sound there was stripped down and solemn, and I heaped praise on that one too for tracks like “Lump Sum”, “Skinny Love”, and “re: Stacks”. Now Bon Iver, the latest project of the well-traveled Justin Vernon, reemerges with an album lusher in sound, but no less meticulously crafted. Songs like album opener “Perth” start slow and grow, with Vernon’s falsetto emerging over a distant snare. The song builds and builds, following horns and cymbal crashes into a swarming musical territory that Bon Iver has never seen before. It’s a genuine stunner of an opening track. “Minnesota, WI” also shows a break from the norm, with Vernon’s voice taking a turn for the lower register and over softly plucked guitar and some jazz-like horns and sax. The wonderful thing about these changes and additions is that they don’t stand out as existing simply to be different or weird, but instead only add to the sound of the tracks. My only criticism of Vernon’s work, whether with Bon Iver or elsewhere, is that the lyrical content of his songs don’t make much sense as a whole. This is intentional, I know, but it leaves the listener to relate to individual lines or the feeling of the music overall. 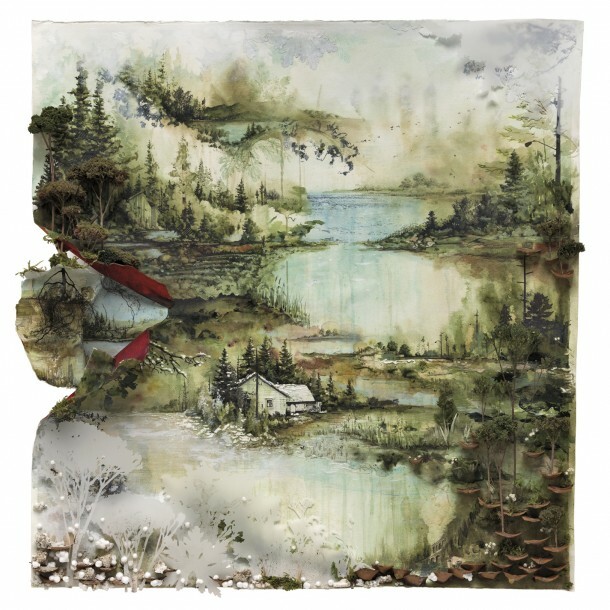 Fortunately Bon Iver masters both those things, and nowhere do they do it better than on “Holocene”, which borrows a guitar portion from an early Justin Vernon solo track as the base. When Vernon emotes “and I can see for miles, miles, miles, miles” or discovers that “at once I knew that I was not magnificent”, there is a special feeling that emerges. As the song builds over the percussion and swells, the album—only on the third track at this point—appears to be headed for greatness. A track by track breakdown would be the only way to do every great song justice, because Bon Iver doesn’t miss a single beat here, whether it’s the harmonies on “Towers”, the atmospheric “Hinnom, TX”, the gentle piano and strings throughout “Wash.”, or the soft ear candy of “Calgary”. No review would be fit, however, without dealing with the so-called controversial closing song, “Beth/Rest” (are things controversial only because we call them such?). It takes mere seconds into “Beth/Rest” to recognize the style, with a keyboard patch, the guitar sound, and brass stylings straight out of 1980’s adult contemporary. We’re talking Bryan Adams, Richard Marx, Phil Collins, and company here. I admit that it could have been disaster, but Vernon’s voice soars and aches with sincerity, and so does the track. I would never in a million years use this as the track to define Bon Iver, but is it possible it’s the albums best track? It’s the most memorable, for certain, although “best” is a title that would have to be wrested from “Perth”, “Minnesota, WI, “Holocene”, or “Calgary”. Before hitting publish on this review I stepped back, pondering the five star label that hasn’t been used in years, wondering if I’d regret it. Then I pushed play on “Perth” again. I realized that, if I were to make another top 10 songs of the year list, an accurate list might have five Bon Iver songs on it. The label has been earned, and with this album Bon Iver has added 39 minutes of music that I’ll be listening to, happily, for the rest of my life. Well said, friend. I noticed that the link for "Perth" isn't working-here's a link to listen to the entire album! Unfortunately they've been removing the youtube links pretty quick, but thanks so much for the link! I am in love with "Perth" and hope people click the link and check it out, especially since it's the opening track on the album stream. beth/rest was one of my faves too, could have been made in the 80s as you say. Though his voice is not to my liking on all the tracks, I also liked "Minnesota, WI"